The Whitney Museum of American Art — known as "The Whitney" — is a New York City art museum with a focus on 20th- and 21st-century American art. It was founded in 1931 by Gertrude Vanderbilt Whitney (1875-1942), a wealthy and prominent American socialite and art patron. The Whitney's permanent collection comprises more than 21,000 paintings, sculptures, drawings, prints, photographs, films, videos, and new media by more than 3,00 artists. It places a particular emphasis on exhibiting the work of living artists for its collection as well as maintaining an extensive permanent collection containing many important pieces from the first half of the last century. The museum's Annual and Biennial exhibitions have long been a venue for younger and less well-known artists whose work is showcased there. Since 1966, the Whitney has been located at 945 Madison Avenue at East 75th Street in Manhattan, New York City, New York. Gertrude Vanderbilt Whitney, the museum's namesake and founder, was herself a well-regarded sculptor as well as a serious art collector. As a patron of the arts, she had already achieved some success as the creator of the "Whitney Studio Club," a New York–based exhibition space which she created in 1918 to promote the works of avant-garde and unrecognized American artists. With the aid of her assistant, Juliana R. Force, Whitney had collected nearly 700 works of American art, which she offered to donate to the Metropolitan Museum of Art in 1929, but the museum declined the gift. This, along with the apparent preference for European modernism at the recently opened Museum of Modern Art, led Whitney to start her own museum, exclusively for American Art, in 1929. Whitney Library archives from 1928 reveal that during this time the Studio Club utilized the gallery space of Wilhelmina Weber Furlong of the Art Students League to exhibit traveling shows featuring Modernist works. In 1931, architect Noel L. Miller converted three row houses on West 8th Street in Greenwich Village – one of which had been the location of the "Studio Club" – to be the museum's home as well as a residence for Whitney. Force became the first director of the museum, and under her guidance, the museum concentrated on displaying the works of new and contemporary American artists. In 1954, the museum left its original location and moved to a small structure on 54th street connected to and behind the Museum of Modern Art on 53rd street. On April 15, 1958, a fire on the second floor of MOMA that killed one person forced the evacuation of paintings and staff on MOMA's upper floors to the Whitney. Among the paintings moved in the evacuation was Sunday Afternoon on the Island of La Grande Jatte which had been on loan from the Art Institute of Chicago. In 1961 the museum began seeking a site for a larger building. The Whitney settled in 1966 at the southeast corner of Madison Avenue at 75th Street in Manhattan's Upper East Side. The present building, planned and built 1963–1966 by Marcel Breuer and Hamilton P. Smith in a distinctively modern style, is easily distinguished from the neighboring townhouses by its staircase façade made from granite stones and its external upside-down windows. In 1967, Mauricio Lasansky The Nazi Drawings showed. The exhibition traveled to the Whitney Museum of American Art in New York, where they appeared with shows by Louise Nevelson and Andrew Wyeth as the first exhibits installed in the new museum. However, the institution has been grappling with space problems for decades. 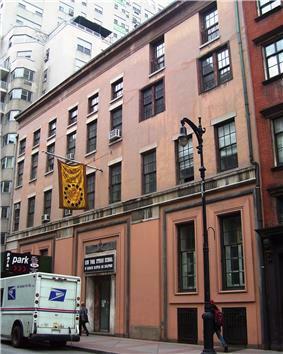 From 1973 to 1983 the Whitney operated its first branch at 55 Water Street, in a building owned by Harold Uris who gave the museum a lease for $1 a year. In 1983 Philip Morris installed a Whitney branch in the lobby of its Park Avenue headquarters. In 1981 the museum opened an exhibition space in Stamford, Connecticut, that was housed in Champion International Corporation. In the late 1980s, the Whitney entered into arrangements with Park Tower Realty, I.B.M. and the The Equitable Life Assurance Society of the United States, setting up satellite museums with rotating exhibitions in the lobbies of their buildings. Each museum had its own director, and all plans were to be approved by a Whitney committee. Since the 1980s the institution has tried to expand its landmark building, hiring star architects to design additions. But each time the effort was abandoned, either because of the cost or the design or both. In order to secure additional space for the museum’s collections, then-director Thomas N. Armstrong III developed plans for a 10-story, $37.5-million addition to the Whitney’s main building. The proposed addition, designed by Michael Graves and announced in 1985, drew immediate opposition. Graves had proposed demolishing the flanking brownstones down to the East 74th Street corner for a complementary addition. After the project gradually lost the support of many of the museum’s trustees, the plans were dropped in 1989. Between 1995 and 1998, the building underwent a renovation and addition by Richard Gluckman. In 2001, Rem Koolhaas was commissioned to submit two designs for a $200 million expansion; plans were dropped again in 2003, causing director Maxwell L. Anderson to resign. New York restaurateur, Danny Meyer opened Untitled, a restaurant in the museum in March 2011. The space is designed by the Rockwell Group. 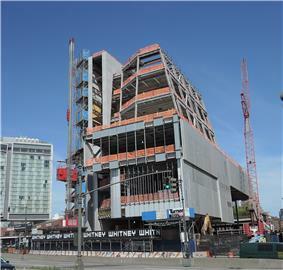 The Whitney is developing a new main building designed by Renzo Piano at the Meatpacking District in lower Manhattan. The new museum at the intersection of Gansevoort and Washington Streets, built on a previously city-owned site will mark the southern entrance to the High Line park. Construction began in 2010 and is expected to be completed by 2015. The new structure spans 200,000-square-foot (19,000 m2) and nine stories that will include the city's largest column-free art gallery spaces, an education center, theater, a conservation lab and a library and reading rooms. Two of the floors will be fully devoted to the museum's permanent collection. The only permanent artwork commissioned for the site — its four main elevators — were conceived by Richard Artschwager. The museum says it needs to raise $760 million for the building and its endowment. In May 2011 the Metropolitan Museum of Art announced it had entered into an agreement to occupy the Madison Avenue building for at least eight years starting in 2015 easing the Whitney of the burden of having to finance two large museums. The original 600 works in the permanent collection grew to about 1,300 by 1954 when the second Museum building opened, and to approximately 2,000 with the opening of the Breuer building in 1966. Today the permanent collection contains more than 18,000 works of art from many renowned artists. Artists represented include Albert Pinkham Ryder, Cindy Sherman, John Sloan, Paul Pfeiffer, Andy Warhol, and hundreds of others. A photography collection was begun in 1991. In addition to its traditional collection the Whitney has a website, called Artport, that features "Net Art" that changes monthly. The Whitney Museum of American Art will not sell any work by a living artist because it could damage that artist’s career. But it will trade a living artist’s work for another piece by the same artist. The Frances Mulhall Achilles Library is a research library originally built on the collections of books and papers of founder Gertrude Vanderbilt Whitney, and the Whitney Museum’s first director, Juliana Force. The Library currently operates in the West Chelsea area of New York City. The Library in West Chelsea contains Special Collections, and the Whitney Museum Archives. The Whitney Museum Archives contain the Institutional Archives, Research Collections, and Manuscript Collections. The Library’s Special Collections consist of artists’ books, portfolios, photographs, titles in the Whitney Fellows Artist and Writers Series (1982–2001), posters, and valuable ephemera that relate to the Museum’s permanent collection. The Institutional Archives exhibition records, photographs, curatorial research notes, artist's correspondence, audio and video recordings, and Trustees papers from 1912 to the present. Arshile Gorky research collection, 1920s-1990s. Edward Hopper research collection, 1894-2000. In 1968, Ron Clark, at the age of 25, established in conjunction with the Whitney Museum of American Art an independent study program (known as the ISP or sometimes the Whitney ISP), which helped start the careers of artists, critics, and curators including Jenny Holzer, Andrea Fraser, Julian Schnabel, Kathryn Bigelow, Roberta Smith, and Félix González-Torres, as well as many other well-known and influential cultural producers. The program includes both art history and studio programs. Each year the Independent Study Program selects fourteen students to participate in the Studio Program (artists), four in the Curatorial Program (curators) and six in the Critical Studies Program (researchers). It is a one year program that includes many both visiting and hired influential artists, art historians, and critics and involves the reading of theory. Ron Clark remains director of the program. As of March 2011, the Whitney's endowment equaled $207 million; the museum expects to raise $625 million from its capital campaign by 2015. Historically, the operating performance has been essentially breakeven. The museum restricts the use of its endowment fund to cover yearly operating expenses to 5 percent of the fund’s value. The Whitney has historically depended on private collectors and donors for acquisitions of new art. However, donations for new purchases have dropped recently, to $1.3 million in 2010 from $2.7 million in 2006. In 2008, Leonard A. Lauder gave the museum $131 million, the biggest donation in the Whitney’s history. The museum's current director is Adam Weinberg (since 2003). Former directors include Maxwell L. Anderson (1998–2003), David A. Ross (1991–1997), Thomas Armstrong III (1974–1990), and Juliana Rieser Force (1931–1948). For years Gertrude Vanderbilt Whitney supported the museum single-handedly, as did her daughter, Flora Whitney Miller, after her, and until 1961 its board was largely family-run. Flora Payne Whitney, served as a museum trustee, then as vice president. From 1942 to 1974 she was the museum's president and chairman after which she functioned as honorary chairman until her death in 1986. Her daughter, Flora Miller Biddle, served as its president until 1985. In 1999, her book The Whitney Women and the Museum They Made was published. In 1961, the need for outside support finally forced the board to add outside trustees, including bankers Roy Neuberger and Arthur G. Altschul. David Solinger became the Whitney's first outside president in 1966. ^ By greg on September 2, 2010 1:10 PM (2010-09-02). "MoMA On Fire | greg.org: the making of, by greg allen". greg.org. Retrieved 2014-01-26. ^ a b Gray, Christopher (November 14, 2010). "The Controversial Whitney Museum". ^ a b c d Vogel, Carol; Taylor, Kate (April 11, 2010). "Rift in Family as Whitney Plans a Second Home". ^ Vogel, Carol (May 11, 2011). "Met Plans to Occupy the Whitney’s Uptown Site". New York Times. ^ Katharine Lowry (June 7, 1976). "The Show Of Muscles At The Whitney Was Vitiated By – 06.07.76 – SI Vault". Sportsillustrated.cnn.com. Retrieved January 8, 2013. ^ a b "library.whitney.org". library.whitney.org. Retrieved 2014-01-26. 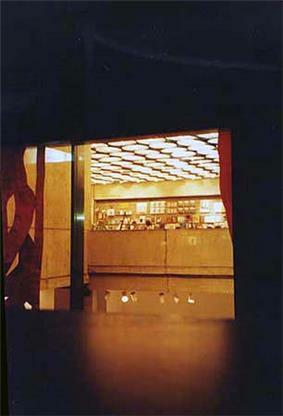 ^ "Whitney Museum of American Art: Archives". Whitney.org. Retrieved 2014-01-26.